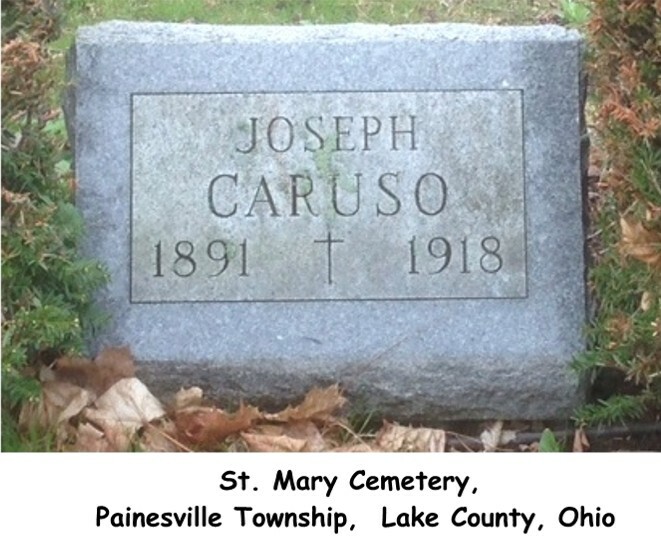 Giuseppe Caruso first appears in the Painesville, Ohio, area about 1915. In America, Giuseppe was known as Joe Caruso. Giuseppe Caruso was born on February 12, 1890, at Settefrate, Italy. He married Giulia Iezzi, daughter of Nicola Iezzi and Maria Serano, at Italy. 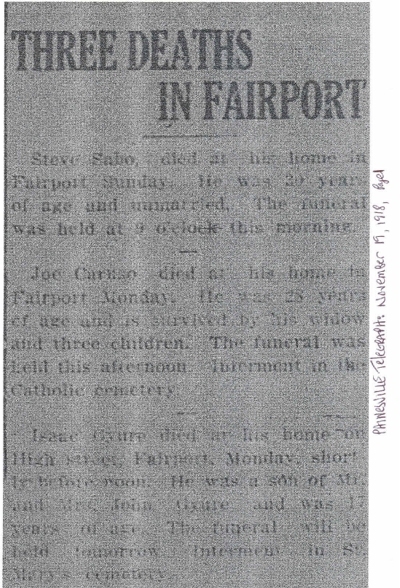 Giuseppe died on November 18, 1918, at Fairport Harbor, Lake County, Ohio, at age 28, of pneumonia, due to influenza. His body was interred at St. Mary Cemetery at Painesville Township, Lake County, Ohio. Giuseppe Caruso immigrated to the United States on November 2, 1907, at age 17, travelling to New York City. He was joining his friend, Giachomino Uitta. He re-entered the United States on June 10, 1913, at age 23, returning to New York City, New York. Giuseppe was joining his cousin, Giuseppe Burreo. Giuseppe registered for the military draft for World War One on June 5, 1917, living at Fairport Harbor, Lake County, Ohio. He was employed by the Diamond Alkali Company.